We have had a crazy many years! 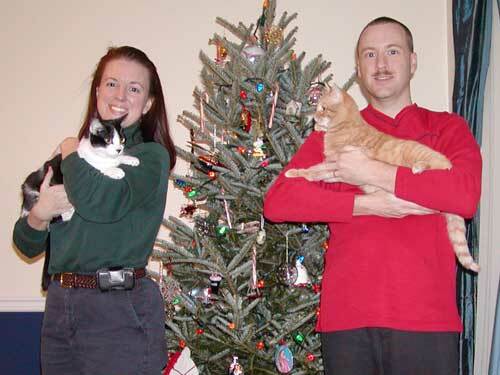 We regret not sending cards the past few years, but we have been a bit overwhelmed. We are now in San Diego, CA as you can see on our cards! Mobile, Alabama was a rough tour for us. We lost many family members and a very close friend in a car accident (about one person each year). 2004 and 2005 were riddled with hurricanes – Ivan, Cindy, Dennis, and the notorious Katrina. 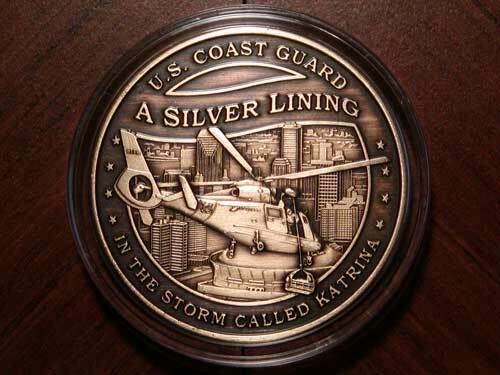 We stayed home during Katrina due to the fact Ed had to fly rescue missions immediately after the hurricane passed. It was a bit frightening as Michelle kept thinking the chimney was going to rip off the house and seeing roof shingles flying around through the boarded up windows. The trees looked like they were in a washing machine while branches and leaves shot through the air. After the hurricane passed, some of our roof was ripped down to the plywood, paint was worn off the house and part of our fence fell over onto our neighbor’s car. We realized how lucky we were compared to the areas west of us. During hurricane Ivan, we ended up better off than the areas east of us. Ed flew many rescue missions from Mobile. The Mobile Coast Guard base had major damage as well, so they were functioning with hand-held radios and a damaged hangar. Michelle started baking food for the crews as soon as we had electricity back. Mrs. Callahan, the COs wife, arranged for the USO to head south to help with the incoming troops to help with security of the Gulf Coast. Michelle volunteered for 6 weeks with the USO along the Mississippi Gulf Coast. Many Mississippi troops coming back from Iraq or Afghanistan came home, but their families had evacuated and their houses were destroyed. Michelle & the USO visited many Tent Cities at Trent Lott Airport, check points, mobile hospital units and more. It was a fulfilling experience. Seeing the destruction up close was unbelievable, it truly was like a bomb having gone off. Houses were gone except for the foundations, insides of houses were hanging in the giant oak trees that were now poisoned by salt water, truck containers were in the Gulf of Mexico, casino barges were up across the highway and we saw a few houses on top of cars or other appliances. 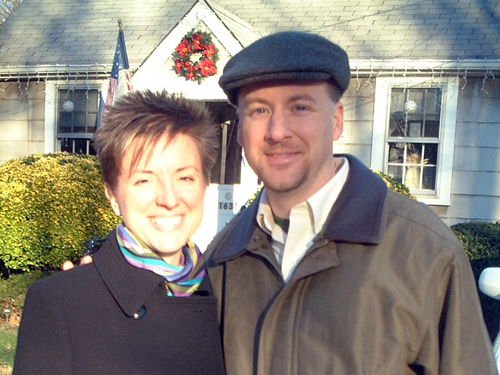 We had an exhausting fall dealing with the hurricane recovery and decided to stay home for Christmas 2005. It was the first time we ever had a tree to put all of the beautiful ornaments we have received or purchased over many years. We had a very peaceful Christmas and had dinner over at the Blair’s, some very wonderful friends of ours. January we found out from the Coast Guard that Ed was selected for a graduate school program. Ed chose to go to San Diego State University. This meant we had to move in May instead of the end of July (our usual schedule for moving). Michelle went to NY to attend her uncle’s retirement party. It was great to see so many family members from around the country! In February 2006 Michelle was diagnosed with a brain tumor after having intense migraines and morning headaches since the summer of 2005. The frequency and problems with the migraines prompted Michelle to constantly go to the doctors. On February 10th Michelle went for a MRI brain scan and a large mass was found in her right frontal lobe. 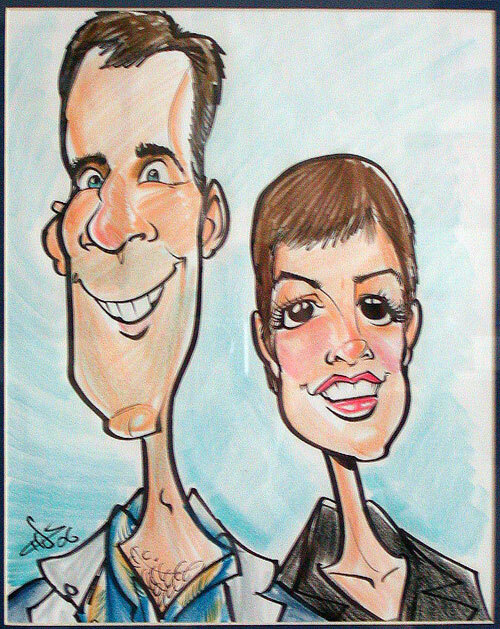 The following day we attended a Mardi Gras Ball we had tickets to, instead of worrying too much about the tumor. Six days later Michelle was in surgery to remove a portion of the tumor. Her parents and brother came to help out and then Ed’s parents came to visit. When Michelle’s parents were leaving our friends Missy, Gina and Andie came to keep Michelle upbeat. Missy even shaved her hair off to be like Michelle!! We were still scheduled to move, so we were very busy packing up half our house to put into storage as we were moving to a town house in downtown San Diego. We are thankful we had many wonderful friends to assist us, even if they didn’t want us to move away. 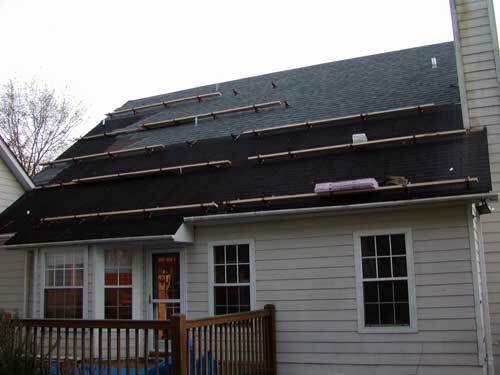 We had already started house repairs in January- new roof, fixing the fence, landscaping, etc. Michelle’s father came for a week to help with some repairs. March was packed with Michelle turning over her Spouses Club offices and her Ombudsman (family representative) to other members, selling the house, wrap-up meetings, Ed finding an apartment in San Diego (his parents flew out there to help), setting up doctors in San Diego for Michelle and a few other things. We sold our house in 24 hours. We seemed to have benefited from a housing shortage due to the hurricanes. It was Very Busy!! April found us packing up most of the house in a PODS container. Quite convenient! 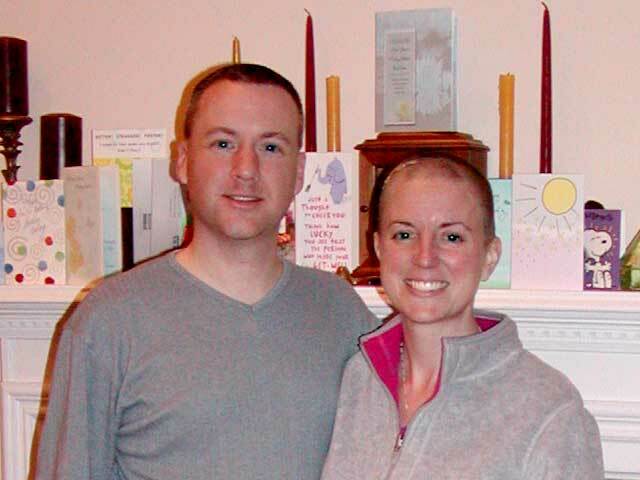 Michelle & Ed participated in a Relay for Life for the American Cancer Society. She was thankful for the donations from her family & friends. Michelle’s parents came for their annual April visit (around Easter). They helped do some packing. Michelle took Mom to a Bunco game. Michelle & Ed went to their last local medieval event to say farewell to friends. At the end of April, the packers came, then the movers and all of our goods were off to California from Mobile, Alabama! Michelle’s Dad flew back down to help them drive the vehicles to San Diego because Michelle was still unable to drive. May 1st we headed west! We stopped in Phoenix to see Michelle’s cousin and her son. We arrived in San Diego many days later. 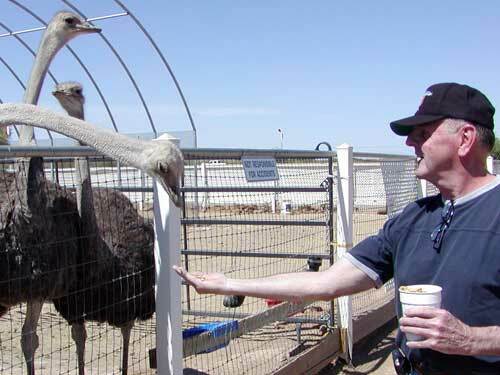 One vivid memory will be the ostrich farm we stopped at where Dad had his whole hand engulfed by an ostrich mouth – very exciting (Dad didn’t read the instructions for hand feeding!) Michelle met with her new neurosurgeon – Dr. Holland, who is quite an amazing man. The kind of person you want doing your surgery. Dad was picked up by Uncle Charlie so they could go fishing for a week. The following months Ed started his new masters program at San Diego State University. Ed has had two very successful terms so far. We have been able to visit family in the LA area and Chula Vista. We have gone to the local Sea World with family. We live in downtown and have enjoyed exploring the city and its offerings. Michelle’s cousins had a new baby. Michelle’s parents came to visit and enjoyed their stay. August was filled with doctor appointments for Michelle. We found time between Ed’s terms to fly to NY and CT. Michelle flew up early and went fishing with Mom & Dad. She caught a nice size fluke and then caught a much larger fish. After a bit of a struggle, her line broke and the fish got away with a nice rig. Ed flew in and we went to CT. We got to see most of the family when we had a wonderful dinner at Ed’s parents’ house. We drove to Maine to see Ed’s brother and family. September brought Aunt Patty and Sue to California. Michelle’s cousin and his friends came by one day with Segways to ride downtown. Michelle had her first Tumor Board Clinic. The doctors recommended additional surgery before chemotherapy or radiation. She had to think about that! Michelle took a trip to NY in October to see family and friends. Mom treated her with a belated birthday dinner! YUM. She enjoyed visits and wonderful dinners with long time friends. We also had a fantastic dinner with her brother and sister-in-law. 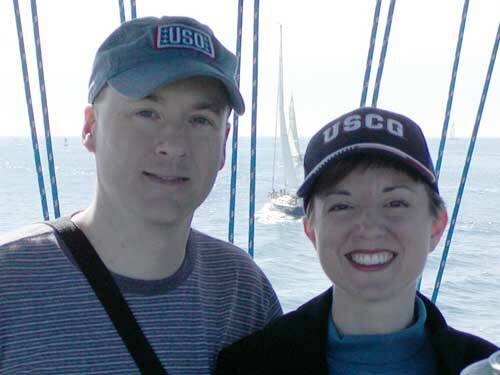 When Michelle returned home, we went on a family & friends cruise aboard the USCGC EDISTO. It was a beautiful day followed by a great BBQ. After doing quite a bit or research, Michelle decided to proceed with additional surgery. November was relaxing. We went to see Blue Man Group. It was fun, but Michelle got overloaded with the lights. We spent a family filled Thanksgiving at Aunt Maryann’s. At the end of the month, Michelle flew to Charlotte, NC to see her best friend. While in Charlotte, Michelle & Lori went shopping and out to some great restaurants. The highlight of the visit was getting last minute tickets to Spamalot!! What a fun show. Michelle began her operation preparations for January. Ed wrapped up his class projects and papers, then took his finals. We went to our complex holiday party, did some packing, saw our family the next day, and packed some more. We are spending the winter holiday in NY and CT for the next couple of weeks. Once we return we will have a few days to prep for Michelle’s surgery on January 8th. We hope everyone has a safe and wonderful holiday! Our latest address and contact information is on the enclosed business card. And as most say – ring us up if you are in the area or need a place to crash for a bit. Thanks for reading!! We miss you!